Buy your $5 raffle tickets today! We’re raffling off one roundtrip for two people for any regularly scheduled WestJet location! 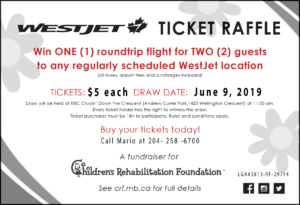 Call Mario at 204-258-6700 to get your raffle tickets today!